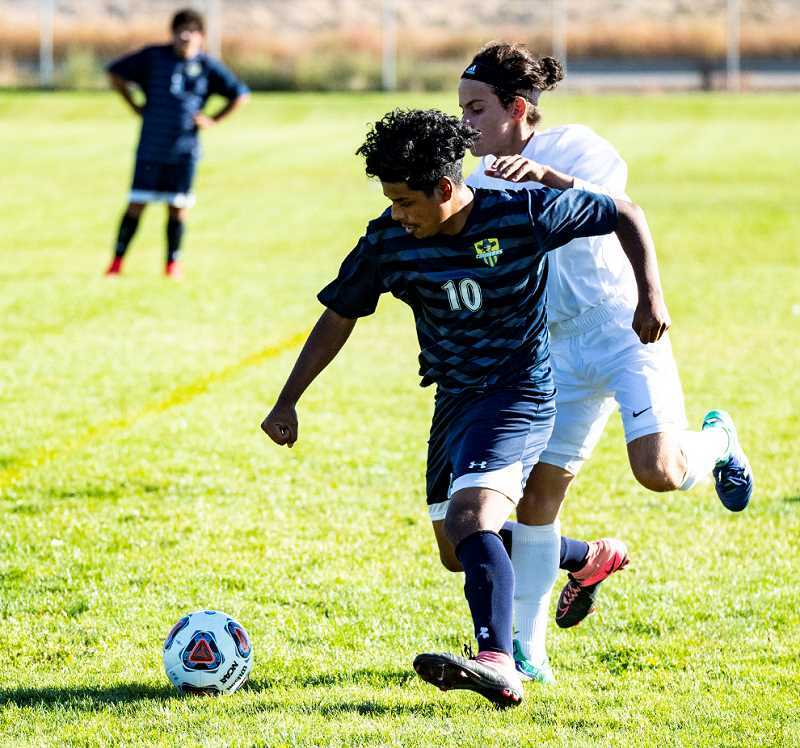 The Ridgeview Ravens remained undefeated in Intermountain Conference soccer play with an 8-0 blanking of the Crook County Cowboys Tuesday evening in Redmond. The Ravens, who had tied their last two league matches, came out on fire against the Cowboys, scoring five first-half goals as they dominated play. "They were a new team, and we didn't really know what to expect," Crook County captain Moses Freauff said following the match. "We were all kind of nervous getting into that game. Their players were really fast, but I think that we were able to cut them down with our defense. The defense came together, but the offense wasn't really playing as well, so that kind of hurt us." The Crook County defense held Ridgeview scoreless for the first few minutes of the game. However, each time the Cowboys would get the ball out of their end of the field, the Ravens would regain possession of the ball and immediately pressure Crook County. Ridgeview finally broke through for their first goal of the match eight minutes into the contest when Cade O'Neill scored on an assist from Jonathan Orozco. One minute later, Christian Kim scored on an assist by O'Neill to make the score 2-0, and the Ridgeview rout was on. O'Neill scored two more first-half goals, and Kim added a fifth as the Ravens rolled out to a 5-0 halftime lead. The Cowboys moved Freauff from defender to forward in the second half, and the change seemed to improve the Cowboys' play. "I tried to get more energy up front, and we got more chances in the second half," Freauff said. "We are still fighting and playing hard." Ethan Birmingham Orozco and Isaac Grusy all scored goals in the second half for the Ravens. Although the Cowboys did get more scoring opportunities in the half, they were unable to find a way to score as the Ravens preserved the shut out. With the win, the Ravens improved to 2-0-2 in league and 4-2-2 overall, while Crook County fell to 2-6 overall and 1-3 in conference play. The Cowboys hosted the Redmond Panthers (2-5, 0-4) on Thursday. The team then has a week off before going on the road to take on The Dalles/Dufur in a 4:30 p.m. match. The team does not return home again until Tuesday, Oct. 16 when they take on Hood River Valley. Hood River Valley and The Dalles/Dufur are currently tied for first place in the Intermountain Conference with identical 3-0-1 league marks. "Come out and cheer for us," Freauff said. "We are going to keep fighting, and we are going to win."